Audio track. Use to control tracks that contain digital audio data, which is routed to your hardware audio interface. For details, see Audio track controls. MIDI track. Use to control tracks that contain MIDI data. MIDI tracks can control external MIDI devices or software instruments. For details, see MIDI track controls. Instrument track. Use to control software instruments. For details, see Instrument track controls. Bus. Use to create submixes, headphone mixes, and effects sends. 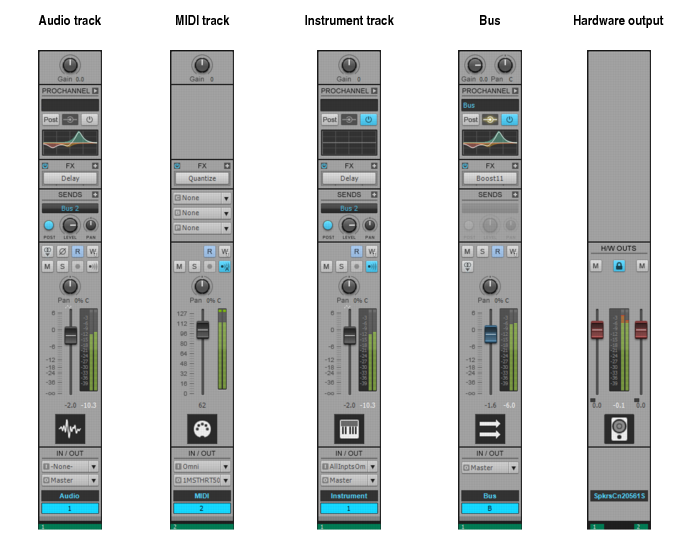 SONAR supports both stereo buses and surround buses. For details, see Bus controls. Hardware Output. Use to control the physical audio outputs of your audio interface. A hardware output channel strip contains both a left and right output and two volume controls. For details, see Hardware Output controls. Figure 651. The controls displayed in a channel strip vary according to the channel strip type. Figure 652. Console view Strips menu. The controls displayed in a channel strip vary according to the channel strip type. Channel strip controls are grouped into various modules that can be shown or hidden. The following modules and controls are available. Pre-fader input gain for fine tuning a track’s volume or input level to a bus. The change in velocity (volume) that will be applied to notes in the track on playback; ranges from –127 to +127. Sets the pan of the audio data sent to the bus. Note: The Input Pan control is not visible in narrow channel strips. ProChannel is an extended channel strip that provides high-quality Compressor, Equalizer, and Tube saturation processing for each channel. See ProChannel (Platinum and Professional only). Note: The ProChannel EQ plot is not visible in narrow channel strips. Adjust the curve of the per-track equalizer. For details, see Using the per-track EQ. The insert location for a track’s plug-ins or soft synths. Activates a send module, which sends a copy of the track signal to a bus. Controls volume of audio data sent by the send module. Adjusts the send pan setting. Note: The Send Pan control is not visible in narrow channel strips. Sends the signal to the bus prior to the track’s volume fader; post means the Send signal goes to the bus after the volume fader. Displays name of bus that the Send is sending data to. Specifies the MIDI channel through which the notes will be played. Specifies the set of patch names available for the track. Specifies the instrument sound that will be used for playback. A switch that inverts the phase of the track. Note: The Phase Invert control is not visible in narrow channel strips. A switch that determines whether a track’s signal enters an effect or chain of effects as mono or stereo, regardless of the nature of the track. Note: The Mono/Stereo control is not visible in narrow channel strips. Note: The Read Automation control is not visible in narrow channel strips. Note: The Write Automation control is not visible in narrow channel strips. Arm the channel strip for recording. The stereo distribution of the output, ranging from 100% left (hard left) to 100% right (hard right); a value of “C” indicates sound that is centered left-to-right. On stereo tracks, pan acts as balance. For surround panners, the signal is sent to multiple speakers at points along a circle. The current volume level for the track, ranging from -INF (silent) to +6 dB (maximum volume). The recording and playback levels are displayed in the Playback and Record meters. Hardware out faders can be linked using the Link button . This allows you to adjust both the left and right channel at the same time. The recording and playback levels are displayed in the Playback and Record meters. For MIDI tracks, the meter shows MIDI activity and velocity. The peak meter value updates during playback to show the highest peak level reached. Track icons allow you to quickly identify a track’s contents by instrument. You can assign a new track icon, create your own track icons, and save an icon as part of a track template. The input source for the track, used in recording. The output bus through which the track is played. A sequential track number used for reference. A name that you assign the track for easy reference. Note that if you do not assign a name to a track, the default name is the track number. This track number will change if you change the order of your tracks. You can click the Track Name control to select any available track, bus or hardware output to display in the Track Inspector. Apply a color tint to the channel strip. For details, see Customizing track/bus colors. The colored WAI bar shows which tracks and/or buses are currently being controlled by a controller/surface. Each controller/surface uses a different color. For details, see The WAI display. Figure 653. Audio track controls in the Console view. Figure 654. MIDI track controls in the Console view. Figure 655. Instrument track controls in the Console view. Figure 656. Bus controls in the Console view. Figure 657. Hardware Output controls in the Console view. The Console view shows if a control is grouped with one or more other controls, armed for automation, and if automation exists for the control. 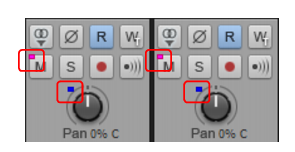 Small color-coded squares are displayed when knobs, faders, or buttons are grouped. Figure 658. Grouped control indicator. For details, see To group controls. A red rectangle outlines any controls that are armed for automation writing. You can write enable the entire channel strip, or individual controls. Figure 659. Armed for automation indicator. For details, see To arm a channel strip for automation writing. A small automation icon appears next to any controls that have existing automation data. Figure 660. Automation present indicator.